Work on the biggest dam built in Scotland for years could soon start at the Highland beauty spot made famous in the TV show Monarch of the Glen. Ardverikie Estate is planning to build the 1,365ft high structure on the River Pattack and shores of Loch Laggan. About 30 construction jobs are expected to be created by the 9MW project – which could provide power for 5,000 homes. The estate said last night it was “hugely excited” by the scheme, and revealed that work could begin as early as spring. Local politicians hailed it as a “fantastic example” of the many innovative projects in the pipeline across the region. Project manager Gavin McGilloch, of Glasgow and Kendal-based hydro turbine specialist Gilkes Energy, said: “We’re excited about the project and working hard to be able to build the scheme within the latest timeframe that we’ve been granted. Plans for the dam were initially approved by council officials in August. The proposals did not have to be discussed by councillors because of minimal opposition to them – with just one local objector. However, a revised plan has now been submitted by Ardverikie Estate to Highland Council which tackles concerns about the original design, reducing the scale of the development to appease Cairngorms National Park Authority planners. The estate would not put a figure on the cost of the project, which will be on a 1,900-acre site, last night. It will involve creating a dam and storage reservoir, and will feed into the National Grid at Dalwhinnie. One feature will be the creation of a three-quarter-mile long lochan – a small pool – about six miles west of Dalwhinnie. Water storage will allow the estate to generate electricity on demand. New public footpaths to the Falls of Pattack will be created by developer RWE Innogy UK to enhance local tourism. Local MP Drew Hendry said: “This is a fantastic example of many innovative projects happening across the constituency. “Its water storage capability is fantastic. 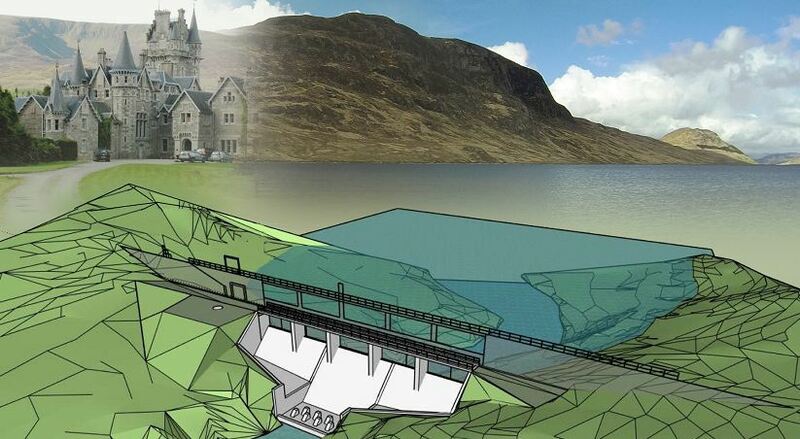 The Ardverikie project will be about a fifth of the size of the massive 1930s Laggan Dam built by the British Aluminium Company. The estate was temporarily renamed Glenbogle for the duration of the hit 1990s TV series Monarch of the Glen, which was based on Compton Mackenzie’s series of novels.